Agriculture, an important sector of our economy accounts for 14 per cent of the nation’s GDP and about 11 per cent of its exports. India has the second largest arable land base (159.7 million hectares) after US and largest gross irrigated area (88 milion hectares) in the world. Rice, wheat, cotton, oilseeds, jute, tea, sugarcane, milk and potatoes are the major agricultural commodities produced. More importantly, over 60 per cent of the country’s population, comprising several million small farming households, depends on agriculture as a principal income source and land continues to be the main asset for livelihood security. After Independence, India followed an agricultural development strategy that focused on self-sufficiency in staple foods like wheat and rice. Agrarian reforms were undertaken in the form of consolidation of holdings, abolition of landlordism etc. However, for most part of the country, these reforms have remained just in paper thus not ensuring equitable distribution of land. Finance and credit was also extended to the farmers from the banks to diminish the control of informal moneylenders with high interest burden. Besides this, expansion of irrigated areas was undertaken and high yielding varieties were introduced leading to increase in agricultural production. Another policy goal vis a vis agriculture was to ensure remunerative prices to farmers (through Minimum Support Prices for key commodities), and maintenance of stable prices for consumers (through food subsidies). Input subsidies were also provided for producers (including producers like fertilizer companies) to keep the costs of agriculture low. “Policy support, production strategies, public investment in infrastructure, research and extension for crop, livestock and fisheries have significantly helped to increase food production and its availability.” (Agriculture Policy: Vision 2020, IARI, New Delhi). Our food grain production more than doubled from 102 million tonnes in 1973 to 247.6 million tonnes in 2012-13. Most of it can be traced to productivity gains and not so much to increase in cultivated area. However, production gains from green revolution technologies could not sustain beyond the mid-1980s. Even now, average yields of most crops in India are rather low. The policy makers attribute this to gaps in technology, irrigation, inputs and pricing policies. After an initial thrust the public sector investment in agriculture decelerated considerably. Planned outlay in agriculture and allied activities declined from 14.9 per cent in the 1st plan to 5.2 per cent by the 10th plan. The state’s thrust in India’s agriculture was on enhancing production of a few commodities like rice and wheat in specific regions much to the detriment of rainfed dry areas which account for nearly three-fifths of the net sown area and where most of the poor farmers reside. This led to regional imbalances. Growth in non-farm employment was limited except in certain pockets like Punjab. The availability of foodgrain per person has increased only marginally and over 25 per cent children suffer from serious malnutrition. In addition, the marginalisation of land holdings continued with 63 per cent of holdings being below 1 hectare as per the agricultural census of 2000-01. To make the country self-sufficient in foodgrains and reduce our dependence on imports, high input driven “green revolution” agriculture was introduced in the late 1960s in pockets of north western and coastal peninsular India. The green revolution package comprised introduction of high yielding varieties (HYV) of seeds, application of chemical fertilizers, pesticides and expansion of irrigation. The country had just faced a severe drought in 1967 but was able to achieve self-sufficiency in foodgrain production in a period of just five years . While the self-sufficiency in Indian agriculture was highlighted by the proponents of green revolution, from 1970s the concept came under criticism both on socio-economic and ecological grounds. “The main criticism directed against green revolution successes was that high yields could only be obtained under certain optimum conditions: decent irrigation, intensive use of fertilizers, monoculture (for the rational use of machinery and agricultural equipment) and pest control with chemical pesticides (also requiring monoculture).” (Bernhard Glaeser, The Green Revolution Revisited: Critique and Alternatives, Routledge, 1987). The other criticism of green revolution agriculture was that it favoured the big and medium farmers and led to income distribution in their favour. This further marginalised the small and marginal farmers. Agricultural research and extension catered to two crops at best – wheat and rice – and could not respond to the social demand of the majority of the farmers in the rainfed areas. The other impacts of green revolution include the chemicalization of agriculture and its impacts on soil and water, excessive groundwater depletion and the undue use of energy for producing food (drawing groundwater, producing agricultural inputs like fertilizers and pesticides). Some scholars like Pierre Spitz have called it the ‘wheat revolution’ and have questioned the appropriateness of the model patterned on agricultural models of industrialized countries for a country like India. Spitz has made plea for “alternative technologies which could ensure less uneven development between crops, regions and social groups – reducing disparities between them as well as between seasonal income, employment and year to year production”. India’s first comprehensive policy statement related to agriculture dates back to 2000 (National Agricultural Policy (NAP)). The policy statement aims at a growth rate in excess of 4 per cent annum in the agriculture sector, efficient use of resources, regional equity, demand driven growth that caters to domestic markets and maximum benefits from exports of agricultural products in the face of challenges arising from economic liberalization and globalization. The key agricultural related programmes of the government today are the National Food Security Mission and Rashtriya Krishi Vikas Yojana. Agricultural sector reforms and structural adjustments were initiated in India since 1990s after it accorded to the World Trade Organization (WTO) agreement to integrate with the global trade. Globalisation of Indian agriculture though intended to improve the efficiency, productivity and cost competitiveness has had adverse impacts with both growth rate in agriculture as well as employment in rural areas declining during the post reform period (from 1990s till date). The growth in agriculture GDP which stood at 4.7 per cent per annum during the 8th Plan (1992-97) progressively declined to 2.1 per cent per annum during the 7th Plan (1997-02) and 1.8 per cent per annum during 10th Plan (2002-07). Public investment in irrigation and other related infrastructure necessary for agricultural growth declined. Growth rate in agricultural employment in rural areas was 1.38 per cent during 1983 to 1993-94 which declined to 0.12 per cent during the post reform period of 1993-94 to 2005-06. The state intervention in agricultural sector rendered large masses of small and marginal farmers vulnerable as they found it difficult to compete in global markets. The farmer is faced with multiple threat from all fronts –uncertain yield, uncertain price, input (spurious quality) and technology (limits to groundwater draft). Agriculture products are being increasingly dumped from developed countries into India. To make agricultural markets responsive and to allow contract farming, the Agricultural Produce Market Committee (APMC) Act was revised. Restrictions were removed on futures trading on many commodities and Foreign Direct Investment (up to 100 per cent) allowed in many agribusiness sectors. Agriculture became a riskier and a low return activity. The increase in input costs far outweighs the increase in output prices and rise in productivity leading to agricultural profitability rates going down (CACP, 2000). In addition, agricultural diversification by small and marginal farmers towards high value crops rendered them food insecure and added to malnutrition problem. Women bore a disproportionate burden of adverse agricultural policies as they were paid less than men for the same work and had less access to credit and other productive resources needed for agriculture like irrigation, inputs and technologies. The attempts by India to introduce effective modern technologies particularly agricultural biotechnology has met with resistance. India is continuing to go ahead with genetically modified (GM) crops even when a report of the Parliamentary Standing Committee on Agriculture states that they are just not the right solution for our country. The report was based on an understanding of the potential and actual impacts of GM crops to our food, farming, health and environment. The multinational companies charge exorbitant rates for the genetically modified crops. This is the experience in the case of Bt. Cotton that because of the patent regime they hold their monopoly power over the genetic resources; because of the high rates for the genetically modified seeds, the common peasants do not get benefits from the use of genetically modified crops. Indian agriculture is facing numerous challenges. While farm income is dwindling due to high input costs and errant weather, quality of natural resources like soil nutrients and water is also degrading at a fast pace. No wonder then that number of farmers declined by 15 million from 1991 to 2011. Meanwhile, the demand for food is rising and land resources are shrinking thanks to urbanisation. As is evident, all these challenges are interlinked and hence need to be tackled simultaneously. Some of the key requirements are to substantially increase public investment in agriculture, ensure better price to farmers, reduce input costs, promotion of climate resilient crop varieties, better and more local storage and distribution of food grains, and improvement of soil and water quality. A farmer’s income is the difference between input cost and selling price of his produce. Since the cost of inputs, including seeds, fertilizers, pesticides, fuel to draw out water and machines, is rising, the profit made from sale of crops is declining. In contrast, income from non-farm employment has been on the rise thus turning farmers into one of the most deprived sections of India. The Central government announces assured minimum support price every year, but that has failed to offset the rising input cost. Assured market is only available for wheat, rice, sugarcane (thanks to public distribution system) and cotton, which is why attempts of diversification tend to fail. For other crops like pulses, there are not enough buyers who offer the support price and farmers are forced to go for distress sale. On the other hand, present-day wholesale markets have long chain of intermediaries resulting in wide gap between the producer and consumer prices. Direct marketing, which does away with intermediaries and hence gets better price to the farmers, needs to be promoted. Farmers’ markets, especially in case of vegetables, have shown good results. Such markets have also promoted diversification as farmers include a wider variety of vegetables, and maximise use of water and land resources throughout the year. But such a setup is lacking in case of food grains. Currently, there is limited warehousing capacity in the country. Having local procurement, storage and distribution network will substantially reduce costs on transportation and multiple handlings. For this, every state should come up with a network of mandis and adequate storage facilities with involvement of gram sabhas and women self-help groups. This storage infrastructure can also come with allied facilities like processed farm produce and quality control. Formal credit system and insurance against crop failure are yet to make the expected impact on the farming landscape in India. Coverage of all crops under insurance and availability of credit on easy terms can go a long way in ensuring financial security. But more than that, having multiple income sources on a single farm, like beekeeping, cultivation of herbs, agroforestry, poultry and livestock rearing, are good cushions against crop failure. Direct income to farmers through a government panel on lines ofpay commission is another concept finding favours of the Karnataka government and can go a long way in checking migration of farmers to other sectors if implemented properly. A perception about agriculture is that it is an individual enterprise whereas if we look at the old times, farmers always helped each other in fields and got a portion of produce in return. This not only helped deal with shortage of farm labour, but also promoted community sharing. With modern agriculture, the practice has become impersonal as machines and migrant labourers do the job at a price. The only solution to check rising input costs is to make farming a collective enterprise. Hiring of implements through local farmers’ cooperatives would not only cut down expenditure on machines but also fetch extra income for the farmers. Similarly, linkage between formal and farmer-saved seed systems through local enterprises would reduce costs and promote scientific temperament among farmers to develop new crop varieties. Stress on organic manure, natural ways of pest control and mulching of crop waste and weeds in the field should be promoted. Incentives to farmers who take to natural or organic farming and adequate marketing linkages for their produce will cut expenditure on fertilizers, pesticides and other chemicals. Organic manure, vermi compost, incorporation of legume crops and mulching will also help replenish the depleting soil health and fertility besides improving soil moisture thus requiring less irrigation. It’s a fact that holistic methods like organic farming don't offer a quick fix and demand a long-term commitment which is why incentives to cover the reduced income during the transition period would be required. Sikkim is already on its way to becomeIndia’s first organic state by 2015. In India, water availability per capita has declined from 5000 cubic metres (m3) per annum in 1950 to around 2000 m3 now and is projected to decline to 1500 m3 by 2025 leading to far less water availability for agriculture. The water availability for agricultural use has reached a critical level as the country uses more than 80 per cent of the surface water for this sector alone. 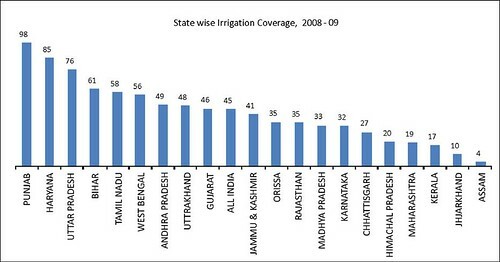 On the other hand, inefficient and dilapidated canal irrigation systems have led to a spurt in groundwater development. India is the largest user of groundwater in the world with over 60 per cent of irrigated agriculture and 85 per cent of drinking water supplies dependent on aquifers. Our input subsidies and commodity price policies favor crops like paddy that are water intensive. While it is good to use water efficiently in agriculture a case is being made where water from this sector will be reallocated to other economic sectors like industry. The water use may be reduced by as much as 21 per cent by 2020 and this may result in drop of yields of rice in particular, its price rise and reduced foodgrain availability for poorer sections. Several states offer free electricity to draw out groundwater for irrigation. However, erratic power supply forces farmers to rely on diesel-run generators, which add to the cost. With water table going down drastically due to overexploitation, expenditure on re-digging of borewells and higher capacity motors is also unavoidable. To deal with this crisis, aquifer recharge and rainwater conservation through community ponds and recharge wells should be promoted with involvement of gram sabhas.Lessons can also be drawn from the work of Sankalpa Rural Development Society (SRDS) which has been training farmers of Karnataka on revival of defunct borewells. Tiny slits are made into the casing pipe of a tubewell around which a pit is excavated. The pit gets water from an adjoining pond which enters the casing pipe through the slits thus proceeds to replenish the aquifers. Sharing of borewells by a group of farmers is another possibility which the WASSAN (Watershed Support Services and Activities Network), has already worked on successfully in Andhra Pradesh. Such instances, though on a small scale, offer hope as they are easier to replicate. Conservation techniques like zero-tillage, raised-bed planting, precision farming and drip or sprinkler irrigation have shown good results in soil and water conservation but needs further improvement in technology for wider acceptance. System of Rice Intensification (SRI) hascaught imagination of several farmers especially in Bihar and Andhra Pradesh as a water-conserving method of paddy cultivation. The technique needs a bigger push from the Centre to make it a universal concept. On policy level, attempts are being made in states like Maharashtra to secure water rights to users (including agricultural users), have tradable water rights and in the process privatise water. Unexpected weather conditions and changing rainfall pattern have been noticed all over the world especially in last few years. These events upset the calculations of farmers thus affecting the normal sowing and harvesting cycle of crops which leads to lower yields. To deal with this scenario, not only the farmers need to take to weather-resilient crops, government also needs to equip them with appropriate information. Strengthening climate risk information and tools should be accorded top priority to minimise crop losses on account of disasters. Weather forecast should be prepared at block level with village level outreach. Promotion of weather-resistant crop varieties like flood and salinity resistant rice and drought-resistant pulses should be promoted and further improved. Likewise short-cycle crops of particular region which can withstand heat and ripen before heavy rains should be given due recognition. Narendra 97 is a good example of a short cycle paddy crop grown in Uttar Pradesh that can deal with intense heat and ripens in a shorter period than the commonly cultivated paddy. It has proven effective in flood prone areas. Millets, one of the major grains of Indian landscape, have been pushed back because of preference given to wheat and rice. However, these coarse grains are known to grow in hard conditions and are our best bet against climate change. A compilation of such crops should be created, disseminated and field-tested in different parts of the country. Mixed cropping like growing paddy with pulses, millets and vegetables should be promoted to ensure food security in case one of the crops fail due to drought or floods. Greater urbanisation and industrialisation has led to increase in land rates. While land is fetching the maximum value, the demand for food is also rising due to improved spending power of Indians and increasing food wastage. Waterlogging and salinity are also turning fertile fields into waste at many places. While there needs to be a ban on acquisition of farm land for non-agricultural purposes, waste land should be reclaimed. According to the State of Agriculture report 2013, there is 25 million hectare of cultivable fallow land in this country, which can give around 40 million tonne grain. Integration of this reclamation work with rural job guarantee scheme can give good results. Despite being the second highest producer of wheat and rice in the world, India accounts for one third of world's hungry. Grains rot in the granaries and pilferage has been rampant in the ambitious public distribution system which has failed to reach the needy.Chattisgarh has done well in checking the rot by shifting the management of the public distribution system outlets from private licensees to community-based organisations such as gram panchayats (village councils,) female self-help groups and co-operative societies. Online tracking of food supplies has also gone a long way in ensuring that poor do not sleep empty stomach. Decentralisation of control and procurement plus distribution at local level can be worth emulating to ensure food security and well-fed population. In several villages of Bihar, Odisha and southern states, concept of common village granary has been in practice traditionally. Anyone in need of food can approach the village committee and take the quantity of grain needed on a condition that he will return the grains along with interest during the next harvest when he would most likely get some manual labour work in the fields. As is evident, Indian farming is facing several daunting challenges but the solutions are also at hand. However, these would only be successfully implemented when involvement of people is ensured as decision makers, monitors and evaluators. Calculating water availability and crop budgeting can prevent over-extraction of groundwater and mounting farm debt. Farmers of West Bengal are resorting to rice transplanters and zero tiller machines to save water and labour cost and to increase productivity. On International Women's Day today, we take a look at the critical connects between gender and water. Thousands of farmers in Bardhaman district, known as the rice bowl of West Bengal, are suffering huge losses due to the shortage of water. There are many reasons why we see more droughts in India these days. Here is all the information that you need to know droughts better. Once abundant with water, Sikri village is fighting a losing battle to meet its water needs. Could the water towers of Asia be drying up soon? Private provision of water services is most successful where the operation and maintenance contracts are offered by the local water users. India has, over the last 50 years, spent approximately $50 billion on developing water resources and another estimated $7.5 billion on drinking water, with little to show for the money (Devraj 2002). Apart from big dams and irrigation systems, the government has encouraged the digging of millions of tube wells and borewells energised by electric and diesel-driven pumps that now provide half of the country’s irrigation. Still, around 120 million people in India do not have access to safe drinking water, and about 21 percent of all communicable disease in this country are water related. Healthy forests are necessary for healthy rivers and prosperous communities that depend on the river, say experts. Odisha is home to 11 major rivers of which many are interstate rivers such as the Mahanadi. As climate change makes extreme rainfall events more frequent in the state, there is an urgent need to better manage the rivers and their basins. Most of these rivers are faced with conflicts arising from issues of flood control, sharing water and hydropower, diversion of water for industries and flood control. These problems are frequently aggravated by the unforeseen consequences of continual human interference in the river basins. The entire food chain is increasingly becoming the primary source of pesticide and antibiotic contamination putting the health and safety of people at risk. The national conclave on food held on March 15, 2019 at New Delhi saw experts urge policy changes to promote sustainable food production especially organic farming as well as regulations to reduce misuse of antibiotics and pesticides. The discussions organised by the Centre for Science and Environment (CSE), a New Delhi-based research and advocacy non-profit underlined the need to regulate bad food and bring in a policy-level change in terms of advertisements on junk foods. Kalpataru is an NGO working in central Orissa on common property resources, specifically sustainable water resources management. As climate change and urbanisation threaten water security in the HKH region, there is an urgent need for good water governance. The Hindu Kush Himalayas (HKH) cover 3500 kms across eight countries namely Afghanistan, Bangladesh, Bhutan, China, India, Myanmar, Nepal and Pakistan. At 42 years, Bhagwat Ghagare seems young. But he is old enough to have seen his village prosper and decline many times. Farming had traditionally been small and distress migration rampant at Kumbharwadi in Ahmednagar district of Maharashtra.